A Palestinian school boy tries to evade and run from the sortie of Israeli tear gas on his way to school. Palestinian children in the H-2 / Israeli military-controlled area of Hebron, besides having to deal with the violence, poverty, humiliation and restrictions on their movement that are a direct result of Israel’s military occupation of the city, must regularly walk through toxic clouds of teargas on their way to school. The hundreds of students attending Ibrahimi, Al Fayhaa, Tareq Ibn Ziad, Khadeegeh, Hebron, and the UNRWA schools, as well as their teachers and neighbors, face collective punishment for the actions of a few boys who throw stones at the checkpoints. 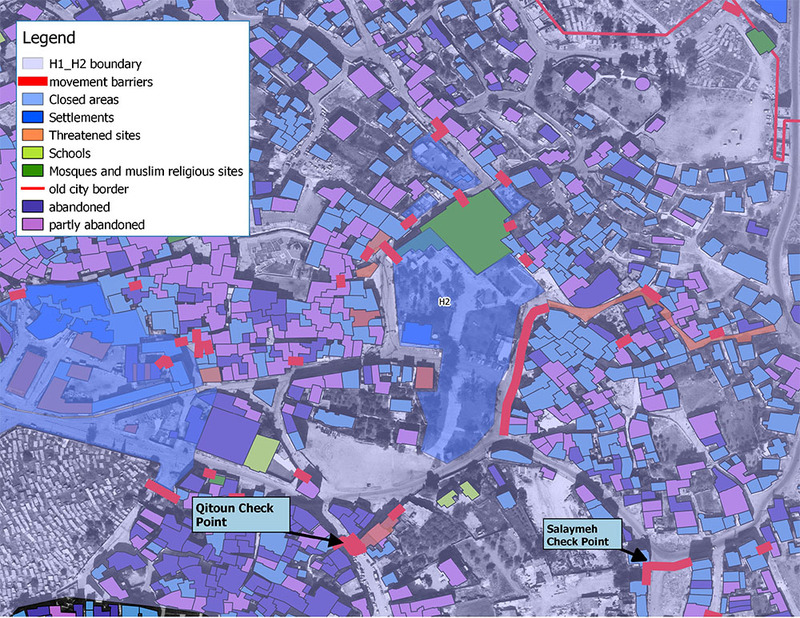 The checkpoints are a relatively recent phenomenon in Hebron. Until the early 2000’s children and teachers walked to their schools as they do in any normal society, but as the Israeli military began to enforce a closure on the Old City, strangling its economic, cultural and social life, it determined these checkpoints were necessary to solidify its control. To put matters bluntly, absolute military control of H2 was worth any consequence to its Palestinian inhabitants –if its draconian measures forced them to leave, all the better. In the standoffs between children who throw stones at these checkpoints and the Israeli military’s sound bombs and teargas, few in the Israeli military high command seem to be acknowledging the basic truth: that if these checkpoints and soldiers were not there as they were not before 2002 and 2004 at Salaymeh and Qitoun, respectively, children would not throw stones at them. The use of teargas against civilians is highly problematic. Although the CS gas used is banned under international law as a chemical weapon for warfare, and Israeli police rarely use it against Jewish protesters inside Israel, the military seems to feel justified using it not only against the boys and youth throwing stones, but also against the hundreds of other children who happen to be walking to school while the stones are being thrown as well as the people living in the neighborhoods around the schools. Tear gas causes respiratory problems and other health issues, and in some cases, has sent children to the hospital. Badly aimed canisters have also set fire to homes surrounding the checkpoint areas. Members of Christian Peacemaker Teams (CPT) consistently monitor the Israeli military’s treatment of children and teachers at the Qitoun and Salaymeh Checkpoints and periodically monitor the Israeli forces activities around the Mutunabi school. The below statistics show the incidents of teargas deployment occurring at just the checkpoints that CPT monitors, not at the dozens of others that it does not. Soldiers regularly shoot teargas and sound bombs into areas around other H2 schools where CPT does not have the resources to monitor. As you look at this data, we hope you will ask yourselves the question: why does the Israeli public and the international community find the gassing of Palestinian children acceptable? Here are the Qitoun and Salaymeh Check Point, the two Israeli military check points that the children must past everyday to go to school.